Thank you for your interest in our villas. We look forward to speaking with you! Villa Lipa Talay Saam is a two bedroom island getaway that is only a few steps away from Lipa Noi Beach. 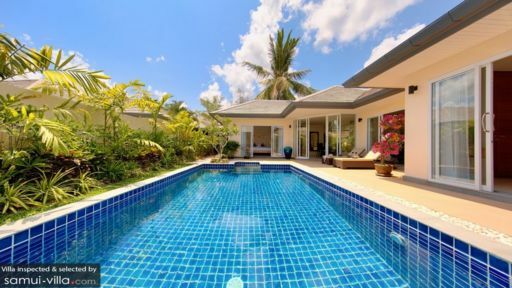 Here at this villa you can unwind and destress by taking a dip in the pool, have dinner and drinks with loved ones, or spend a lazy day in bed catching up on a TV show. On Sundays, you can head to Lamai, a twenty minute drive away, to visit the farmer’s market. With friendly staff and a tranquil location, Villa Lipa Talay Saam is the place to be for a pleasant beachside holiday. There are two cosy and comfortable guest bedrooms here at the villa. In both bedrooms, there are glass sliding doors that give you easy access to the pool and garden area, perfect for guests who like to take early morning swims. Each room is also decorated with stylish wooden furnishings and a few art pieces, which adds a little character to each room. Both also have comfortable king size beds, which will provide you with a good night’s rest. There are also en suite bathrooms that are bright, spacious, and clean. If you ever want to spend some lazy mornings in, the bedrooms also come with flat screen TVs for your viewing pleasure. What better way to spend your mornings than by taking a swim in the enticing blue pool. After which, you can towel off and take your hearty breakfast in the four seater outdoor dining area in the gazebo. Here you can be calmed by the various plants around while enjoying the relative quiet. In the late afternoons, lay back one one of two sun loungers for some relaxing quiet time or in the company of a riveting book. Staying outdoors here in Villa Lipa Talay Saam will be a calming way to spend your time. At Villa Lipa Talay Saam, the kitchen, dining, and lounge areas are situated in one airy space that overlooks the pool and garden. On one end is the comfortable lounge area with a sofa and chair fronting the large glass sliding doors that, when opened, allow the breeze to flow through the space. Here you can have a nice conversation with your loved one while sipping on some coffee or watch TV. On the other side is the fully equipped kitchen and dining area with a beautiful wooden dining table that seats six. Here you can indulge in sumptuous meals while enjoying the view of the outdoors. What makes any vacation extra special is the attentiveness of a competent and friendly staff. Here at Villa Lipa Talay Saam, you’ll get just that. Housekeeping and security will ensure that you feel comfortable and secure during your stay. A multilingual guest manager will see to your needs and help you with any of your requests. Car or bike rentals can also be arranged for your transportation. Should you desire a private chef prepare your meals, that can also be arranged for additional costs. Whatever your needs may be, the staff here at Villa Lipa Talay Saam will strive to make your holiday a pleasant and enjoyable one. 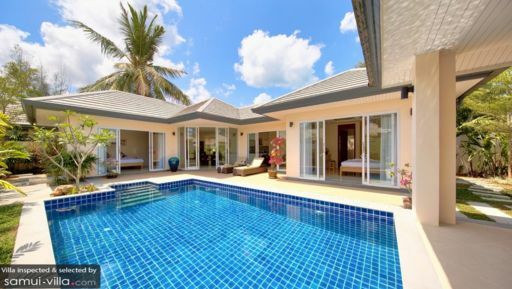 Villa Lipa Talay Saam is located on the tranquil island of Koh Samui in Thailand, minutes away from Lipa Noi Beach. With its white sand and 100 meters of shallow water, Lipa Noi Beach is the perfect spot to have some fun and relax with family and friends. It has fewer crowds, thus providing the best atmosphere for a tranquil afternoon. Compared to the rest of the island, this area is moderately untouched and provides travellers that slower, easy going pace they need to have a relaxing holiday. There are a number of restaurants in the area and if you ever want to venture out, Lamai is a 20 minute drive away. On Sundays, there is a night market where you can eat and browse to your heart’s desire. If you want to visit the bustling area of Chaweng, it’s a 40 minute drive from the villa. Actually it is not close to the airport and tourist spots, but that's why we chose it because the location is great (beach nearby) and so quiet. The villa is so beautiful with a pool that we enjoyed a morning swim together. The owner is really nice and he replied to us when we have any needs. It is not difficult to find restaurant since there are several resort and restaurants nearby and we can enjoy a wonderful beach dinner with your family. Great place and I hope to visit it again. 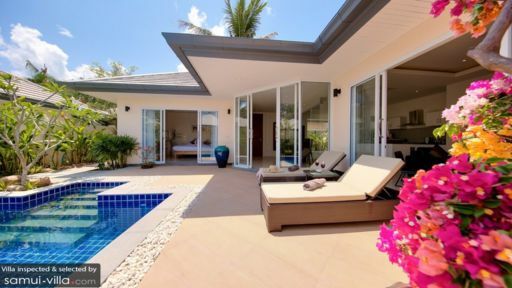 The villa is just a couple of steps from the beach, surrounded by other pool-villas. there is a small family-mart (7/11 like) very near and some restaurants close by as well. a bigger tesco and a big makro markt are about 25 minutes drive away. rental car is recommended the villa is perfect for a private get-away. Still have questions? Call our travel consultants now!